French pianist, born August 15, 1925 in Naples, Italy, died February 1, 2015 in AsniÃ¨res-sur-Seine, France. 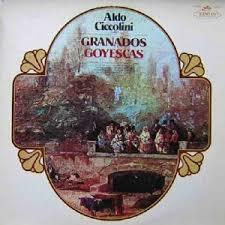 Ciccolini was most appreciated for his interpretations of Maurice Ravel, Claude Debussy and Erik Satie. But also for his performances from less-known composers such as DÃ©odat De SÃ©verac, Jules Massenet, Charles-Valentin Alkan and Alexis de Castillon. He's also well known for his Franz Liszt performances. Aldo Ciccolini made a lot of recordings for PathÃ© Marconi EMI, including the complete piano works of Wolfgang Amadeus Mozart, Ludwig van Beethoven and Erik Satie. He was awarded the Diapason d'Or for his recording of LeoÅ¡ JanÃ¡Ä�ek's complete piano work for Abeille Music and Robert Schumann's piano work on Cascavelle.